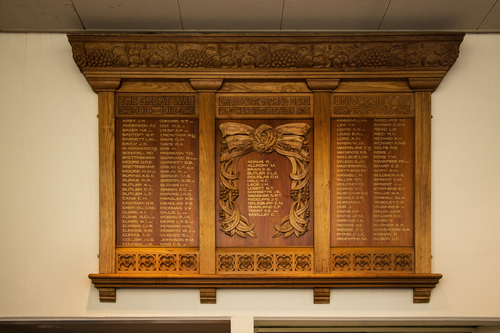 Honour board carved 1924, University of Tasmania . Who was Nellie Payne? FOR almost 100 years, there has been an honour board tucked away at the University of Tasmania that bears testament to a spirit of determination outside of academia. The 125 engraved names belong to the university’s students, graduates and chancellors who served in World War I, including the 15 who died in action or from war-related injuries. The board was commissioned in 1919 to perpetuate their memory, and a century later the university will shine a brighter light on those names and memories. “The board has been tucked away in an area of the University Centre where few people knew about,” said History Professor Stefan Petrow. But the beautifully carved blackwood board has a higher profile in the Faculty of Law building, and will be officially unveiled this week. Prof Petrow will give a public lecture at the unveiling, offering insights into the war experiences of some of those listed. He said the creation of the board was a war story in itself, a “labour of love” undertaken by Tasmanian woodcarver Ellen Nora Payne. He said Payne’s husband and two sons served in World War I, and her nephew was killed in action while serving in Palestine in 1917. “She had designed and carved many memorials, but this particular honour board was a labour of love for Ellen,” he said. The honour board was last unveiled at its completion in August 1924, at a ceremony held on the University’s Queen’s Domain campus. Prof Petrow said the 125 names did not include academic staff, as they were not supposed to go to war. The names are of the men and women who served in many different capacities in both the Australian imperial forces and the British forces. One of the 15 names of those killed in action or as a result of the war include a woman, Sister Janet Radcliffe. Sister Radcliffe tended the wounded in Gallipoli before being discharged, with heart disease and anaemia, and dying in 1922. Prof Petrow hopes his lecture on Thursday will be the first of an annual form of remembrance, for all those affiliated with the university who have served at all wars. The university is appealing for family members of those whose name appears on the board to come to the lecture, or contact them with more details about their ancestors. The public lecture is on November 8 2018 from 10.30am to 12.30pm. at Law Lecture Theatre 1, Grosvenor Crescent, Sandy Bay. Register via link on UTAS website or contact Ceri.flowers@utas.edu.au 03 6226 1874.